Small bathrooms are often painted white or light colours in the hope that this will make them appear bigger and brighter. 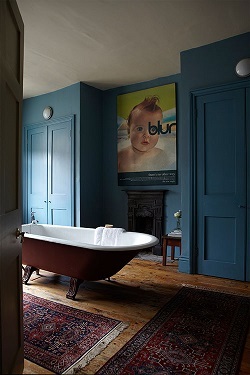 This can work, however it can also create a dull room with little character, instead paint bathrooms in stronger colours and create a truly unique and glamorous space. 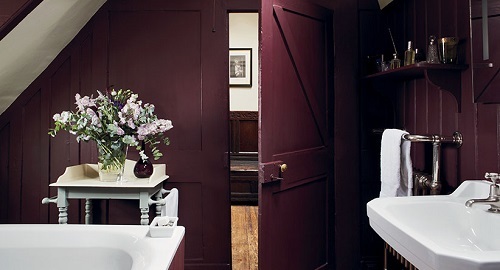 Bathrooms and downstairs toilets with little natural light offer the perfect opportunity to add bold colour without committing to larger, more lived-in rooms in the home. Using strong warm colours, such as Brinjal, Stone Blue or Plummett, will help to create a dramatic yet intimate space. 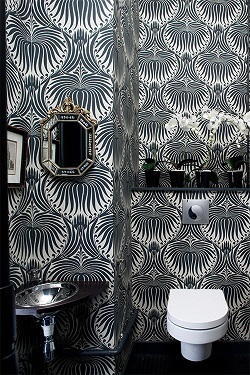 You could even use bold wallpapers like Lotus or Orangerie to the same effect. 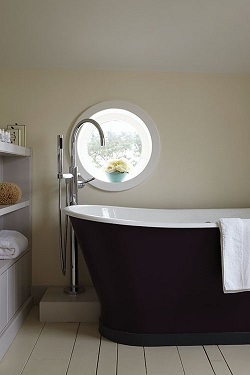 For a relaxing bathroom, try using Purbeck Stone. It’s a strong neutral – neither too grey to be edgy and uncomfortable, nor too creamy to feel dated. Combine with two lighter shades, Ammonite and Cornforth White, to create a relaxed and contemporary colour combination. 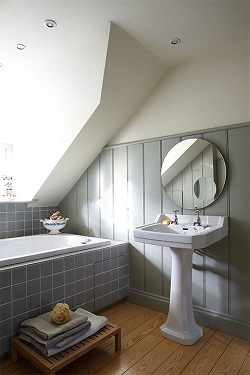 A popular idea is to paint the underside of a freestanding bath in stronger shades like Pelt or Rectory Red to add a pop colour to off-white bathrooms.